Modern Gastronomy – sometimes called “Molecular Gastronomy” (by its detractors) or “Modernist Cuisine” (by its most ambitious proponents) – is magic in the kitchen. It is a revolution. It is here to change the way we eat. No, strike that, it is here to change everything! It is arrogant. It is willful. But even some of its most vociferous critics begrudgingly admit that it is brilliant. Modern Gastronomy is, to be sure, a somewhat easy target. When chef’s don lab coats and use the tools of chemistry and physics more visibly than those of a traditional kitchen, when the equipment – and, in some instances, the raw materials they use – is more commonly found in chemistry labs and industrial facilities than the three star restaurants, it is not very difficult to see why some think it has gone over the top. So what is “Modern Gastronomy?” It is, for the most part, the application of modern science to the ancient art of cooking. At one level, an important one to which we will return, cooking has always been the application of science to the preparation of food for eating. But until recently, the gap between the reach of science and culinary practices had seemingly never been greater. A top restaurant kitchen in the 1970s would have been familiar to Auguste Escoffier in the late 19th and early 20th Century — or perhaps even Marie-Antoine Carême, three centuries earlier. To be sure, food science – as a discipline – was far more open to scientific innovation than was the fine dining kitchen. Many, if not most, of the techniques most readily associated with Modern Gastronomy have long been in general practice in the industrial food business, some with origins far older. “Sous-vide” – cooking food sealed in vacuum packs in a water bath with its temperature tightly controlled (and one far lower than traditional methods) – was first described by Sir Benjamin Thompson in 1799. It was re-discovered by American and French engineers in the mid-1960s as an industrial food preservation method. But the Sous-vide method was not used in fine dining establishments until it was adopted in the 70s by the Troisgros brothers of Nouvelle Cuisine fame. It is now ubiquitous on the Modern Gastronomy scene and far beyond (including my kitchen). It is so for a very good reason. There is, quite simply, no better – no more consistently delicious — way to cook meat. The gentle cooking of the lower heat as well as the precision means that it is nearly impossible to overcook the meat and keeps it to an even doneness throughout. While a quick sear at the end will give the caramelization of the Maillard Reaction on the very outer layer of the meat, 90% of it is “the good stuff” you are used to at the very middle. It is a method that makes the fancy cuts taste great and the less fancy cuts taste even better. And the Sous Vide is far from unusual in being an industrial technique that found a home in the kitchens of restaurants featuring Modern Gastronomy. Food Dehydrators, Centrifuges, Liquid Nitrogen, and industrial ice cream makers such as the Pacojet are a few examples of the tools and equipment imported from both chemical labs and the food processing industry into Modern Gastronomical kitchens. Compounds (almost always organically based) such as hydrocolloids (like gelatins, thickening agents, gelling agents, emulsifying agents and stabilizers), Lecithin, Maltodextrin, and Transglutaminase are some of the “chemicals” that frequent these kitchens. Techniques derived using these compounds and equipment include such fixtures on the Modern Gastronomy Top 10 as: Foams, Espumas, Emulsions, Gels, Spherification, Reverse Spherification, and Powders. Many of these techniques, and the use of many of those compounds and equipment, were pioneered by Ferran Adrià, the legendary – and pioneering – chef of the late-lamented El Bulli Restaurant in Roses, Spain. Adrià and El Bulli are the Chef and restaurant with which Modern Gastronomy – as a style of cuisine – are most closely associated. He, along with his brother Albert and the other top chefs at El Bulli, experimented with these industrial techniques and equipment, finding ways to adapt them to the fine dining kitchen. 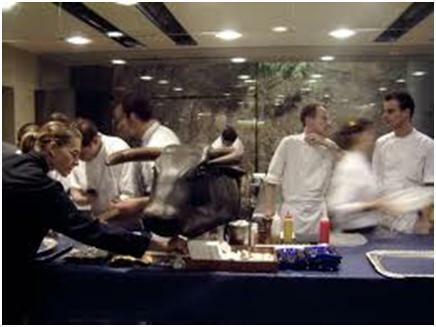 In fact, El Bulli would close for half the year so that the Adrià brothers could run a laboratory down in Barcelona at which they would develop new techniques – “avenues” – around which to build new dishes and a new menu for the coming season. But Adrià’s focus on these techniques had a cost…actually two of them. First, it bred misunderstanding. It suggested that Adrià did not care about flavors as much as the dazzling, mystifying techniques. Nothing could have been further from the truth, of course. No one ever walked away from a meal at El Bulli saying the food sucked. But the simple reality is that what people walked away from El Bulli talking about was the dazzling techniques, not the flavor combinations. Adrià’s cuisine is, it sometimes seems, all about the surprises – the magic, if you will. It seems focused on juxtapositions of the familiar and the unfamiliar — familiar flavors, for example, in an unfamiliar form, something that looks “right” but is the “wrong” temperature. Or, perhaps, something that looks like exactly what it is and tastes like exactly what it is but got there in a totally different way. Adrià’s famous spherified olive juice is one example of that. It looks like an olive, tastes like an olive…but its texture is different and it certainly didn’t grow that way! But it was not Adrià, so much as some of his acolytes (however distant) who have given “Molecular Gastronomy” something of a bad name. In the hands of those who use the techniques blindly there is, indeed, a callow quality that leaves one dazzled but soul-dry. And yet in the hands of Adrià’s actual protégés – such as José Andrés or Sergi Arola – and his fellow travellers – such as Heston Blumenthal or Grant Aschatz – it is thrilling and satisfying both. And yet there is a new breed of Chefs – led by Mugaritz’s Andoni Aduriz and NOMA’s René Redzepi — both of whom spent time working in El Bulli’s kitchen – that utilize the techniques developed by the Adrià brothers while maintaining a focus on nature, on the earth itself, and on a celebration of the restaurant’s specific place. 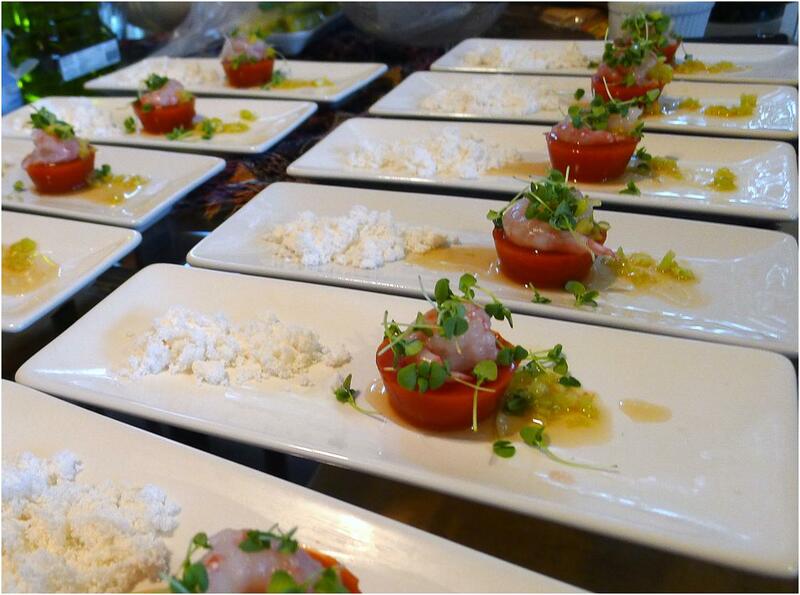 It was with that in mind that I developed this dish of Spot Prawns with Bacon Snow, Tomato-Shrimp Gel, and Nuoc Cham. There is nothing that says “Late March and early April in San Diego” to me as much as Spot Prawns. They are called “spot” prawns – even though they are actually shrimp, not prawns — because of the two distinctive white spots on each side of the tail. Spot Prawn shells have a pale orange, luminescent glow and firm flesh that is as firm and sweet as lobster. And there is no better way to eat Spot Prawns than raw, as Sushi (it is called “Amaebi” and is served in two course, one raw and the other the deep-fried shell). But I had been playing around with various Modern Gastronomy techniques and wanted to put a slightly different spin on Spot Prawns for a dinner of twelve family and friends. I decided to riff off of two classic flavor combinations: pork and shrimp, on the one hand, and shrimp and tomato on the other. And to do so I decided to use two techniques drawn from the world of Modern Gastronomy: powderization and gelification. Nearly all of us have been familiar with the results Gelification since childhood lunches. 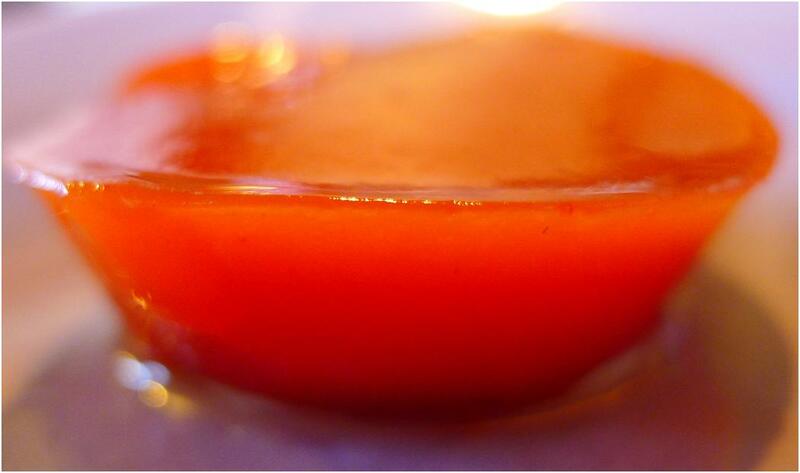 Jello is the result of a gelling agent (gelatin) being applied to sweet liquids. The same, though, can be done with savory liquids such as the tomato juice and shrimp broth I use in this recipe. Many chefs prefer to use agar agar – derived from the cell walls of red algae rather than from ground-up horse hooves (as is the case with gelatin) – because it sets at 110° Fahrenheit but does not remelt until 185° Fahrenheit. This makes Gels using agar agar far more stable and useful in savory dishes. The technique is simple: mix the agar agar powder with the liquid using a whisk, bring it to a boil, pour the liquid into whatever mold or vessel you intend it to set to and then leave it to set in the refrigerator. It is that simple. Powderization works by combining a fat-rich liquid with Maltodextrin powder. The rule of thumb – a very approximate one at that – is that powders are constructed of a 2:1 ratio: two parts solid to one part liquid. I found that with bacon fat the proper ratio was about 1.25:1. While a large percentage of the few recipes talking about this technique recommend adding the solid to the liquid, I recommend the opposite. Because each liquid will react differently – and because I do not trust everything I read on the internet – I submit that the greater flexibility and control of adding the solid to the liquid is a really good approach to the problem. This technique of powderization shows the real power of the Modern Gastronomy. 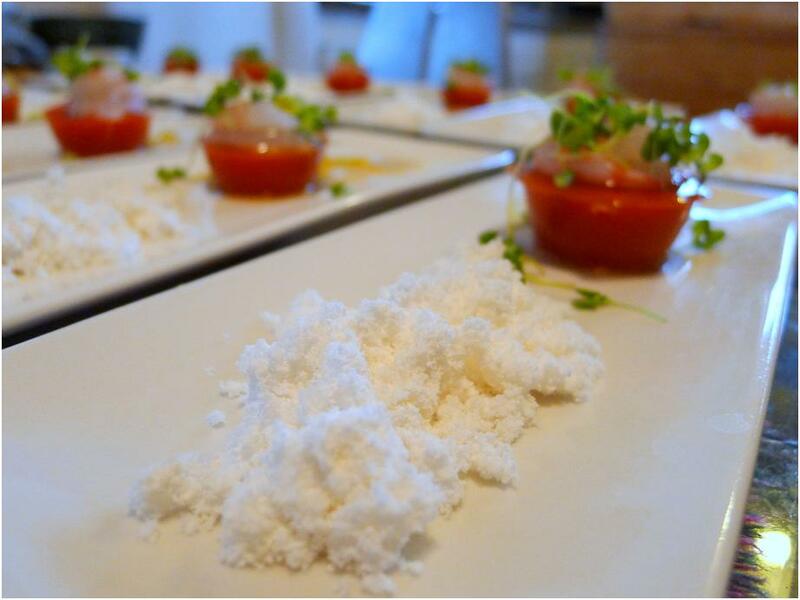 It looks like a powder on the plate, and it is. It is mysterious. If you are not already familiar with the technique you have no idea what to expect, what it will taste or feel like, or even what it is doing there. But when the powderized bacon fat hits the tongue it immediately melts together to form a delicious, satisfying savory burst of sauce-like flavor. It is a bit of magic. And, at its essence, Modern Gastronomy simply offers the chef a new set of tools. It is just another generation’s scientific tools applied to one of the oldest problems on the rock: putting tasty food on the table. Powderization and Gellification are, in that sense, really no different than making a roux or reducing a sauce. It is just additional arrows for a creative chef’s quiver, albeit ever so slightly magical ones at that! Make the Tomato-Prawn Gel. Sweat the onion, ginger, carrot and celery in a sauce pan over low heat for three minutes. Add the reserved prawn heads and shells, two cups of water and bring to a boil. Reduce the shrimp stock by half over medium heat, add the tomato juice and cook for another three minutes before adding the agar agar. Mix the agar liquid thoroughly with a wire whisk. Bring the liquid back to a boil until the liquid visibly thickens. 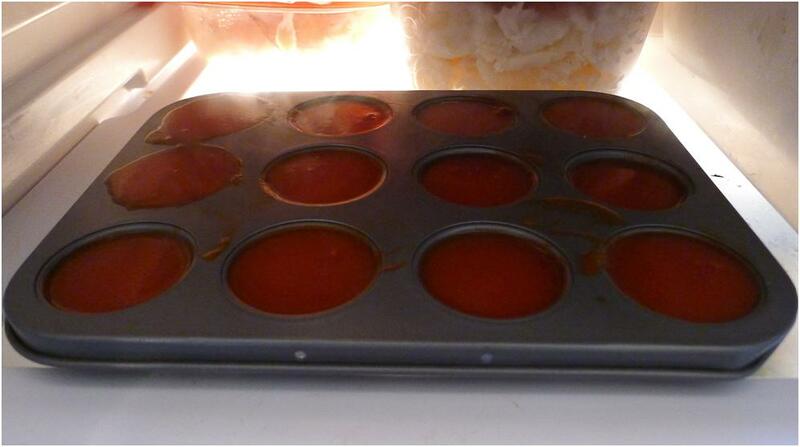 Pour the liquid into a tray of small cupcake molds and refrigerate until the gels are set. Make the Bacon Snow. Place the maltodextrin in the bowl of a food processor fitted with the “S” blade. With the processor operating drizzle the rendered bacon fat into the feed tube, stopping every once in a while to scrape down the bottom. Continue drizzling the fat in until the resulting “snow” reaches the desired texture. It should still feel like a powder in your fingers but should melt nearly the instant it hits your tongue. Make the Nuoc Cham. In a mixing bowl, combine water and sugar and stir to dissolve the sugar. Add the fish sauce, vinegar and lime juice and mix to combine thoroughly. Adjust flavors to taste. Add garlic and chili pepper. Plate the Dish. Place a Gel on one side of a long thin plate and top it with a prawn. Scope some of the Bacon Snow on the other side of the plate in an elongated pile. Spoon some of the Nuoc Cham over the shrimp and Gel. 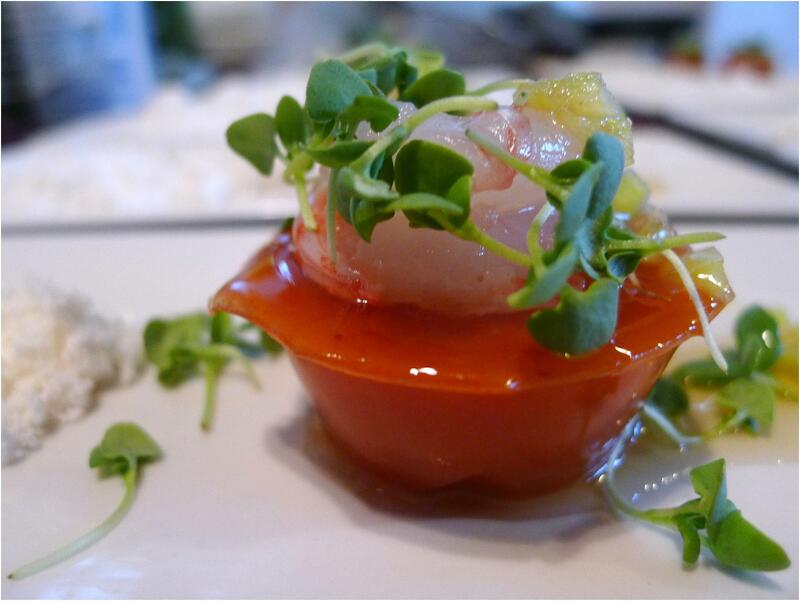 Sprinkle some Micro Basil shoots over the shrimp and Gel.